Our signature heritage cure Irish ham is truly delicious. Cured on the bone, it has a distinctive flavour with a hint of smoky hickory undertones. For the perfect result roast it in the oven low and slow. This ham is ideal for carving and brings ham to a whole new level. Particularly low in salt, with the bone bringing a certain sweetness to the meat. Having received a Great Taste 3 Star Award, here's what the judges had to say: "An impressive joint, juicy and with a good even layer of fat. Wonderfully inviting, moist, pink slices. The fat is delightful and the lean meat is tender, sweet and succulent. Well judged cure and delightfully delicate smoke. There is good pork flavour here. We tried this both thickly chunked and thinly sliced, both were wonderful - we were rather reluctant to let this leave our table". 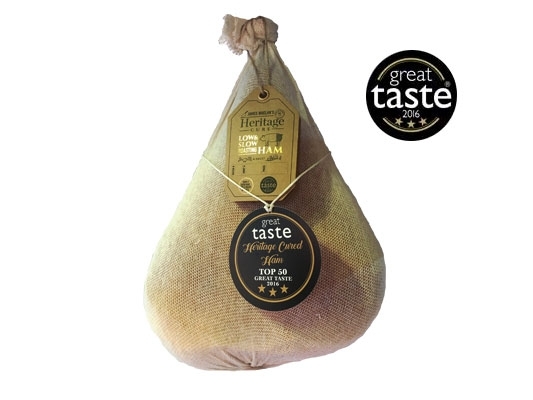 Heritage Cure Irish Ham Weights : 6.35kg (14lb) approx.